Bringing up Bella: Tuesday's Tails: Let's find Chipper a home of his own! Tuesday's Tails: Let's find Chipper a home of his own! A very dear friend of mine reached out to me recently about a sweet little pup named Chipper. Chipper has some special needs but what he really needs is a special home of his very own. Please read his story below and, if you are so moved, help us share his story to find that very special family that certainly must be looking for such a cute little boy like him. 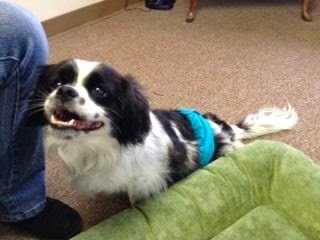 Chipper is a 4 year old male Japanese Chin mix. He had a herniated disc surgically treated a few months ago, and at present has minimal use of his hind legs and poor bladder control. He needs someone who can lift and carry him at times (all 18 lbs of him). 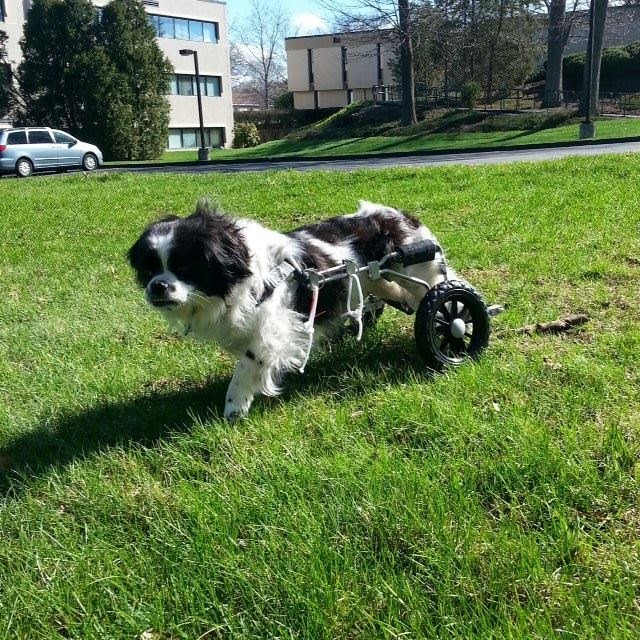 He has wheels to go for walks although he really prefers to cuddle. He's as soft as a bunny, a real sweetheart and loves everyone! Chipper is currently living in a foster home in Franklin, MA. Transport is available. His contact is info@pawsinmotionvet.com. The Tuesday’s Tails blog hop is hosted by Dogs N Pawz and Talking Dogs. This is the blog hop that features shelter pets. Find a pet at your local animal shelter or rescue and join us! Chipper is a cutie and deserves a forever home. We sure hope he finds his special human real soon. Will share. Very cute pup. But it will have to be a special home that is willing and able to have a dog with bladder control and mobility issues. Hopefully the right one comes along for him. I did link up to the Tuesday Tails blog hop for the first time today. I don't have a specific dog to share, but I did share some about the fundraiser put on by one of the local humane societies, where we did a flyball demo over the weekend. Attending and donating at an event like that is such a great alternative to people who are unable to adopt or foster. What a cutie! I have shared and hope that he can find the special home and love that he needs. Thank you Leslie! I know Chipper and can attest that he is cute, sweet and as soft as a bunny! I agree, and let's find other dogs with this condition and help them. food and more online with fast delivery.